We LOVE hearing from our customers and when Michael Burke, Manager of Environmental Services and his team at North Memorial gave us their testimonies, we were excited to share their feedback! Problem: North Memorial’s Healthcare staff was in need of new uniforms as it was time to outfit their staff in new ones. 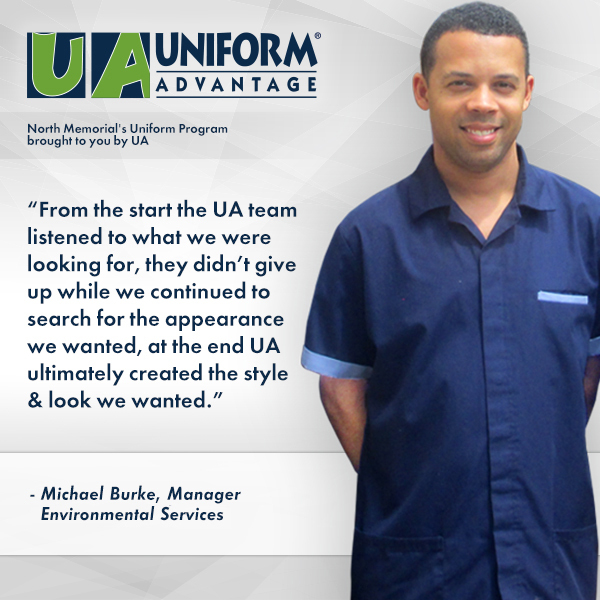 Due to an existing relationship with one of our clients, Uniform Advantage was referred to North Memorial to outfit all of their departments except the surgical teams. This interview highlights Environmental Services which includes Housekeeping, Patient Escorts and Parking, Shuttle & Valet. Solution: Uniform Advantage met with Environmental Services’ leadership to review and choose colors and styles. Housekeeping added a blue piping which gave the uniforms a touch of class. The uniforms have been a nice boost to the Environmental Services employee morale. Michael Burke, Department Manager mentioned that he has been stopped in the halls and complimented on his selection of uniforms – staff is very happy with the design, comfort & breathability. Uniform Advantage: What words of advice would you give a Director who is looking to implement a new uniform program? Michael Burke: Assign the project to a leader who cares, give them the ability to make recommendations, work directly with the staff on what works & what doesn’t, and finally test a few uniforms out to make sure they actually work. There is the overall appearance, the fit of the uniform for both men/women and to determine if the fabric is comfortable when performing day to day tasks. Uniform Advantage: These departments have been recently outfitted by Uniform Advantage: Housekeeping, Patient Transport, Parking, Shuttle & Valet. What colors and styles did you select for each department and why? Michael Burke: To improve patient satisfaction scores “room kept clean” its best practice for EVS staff to enter the room using AIDET which is Announce, Introduce, Duration, Explanation and leaving with a Thank You. When doing so the appearance plays an important role in the positive perception of the patient & family members. We chose blue, using UA we had a variety of pant styles to choose from. This helped fit the various needs of our staff, IE: size of top, hips, length and gender. Uniform Advantage: Tell me how that process worked for you and what your favorite service experience with us. Michael Burke: From the start, the UA team listened to what it was we were looking for; they didn’t give up while we continued to search for the appearance we wanted. UA had mocked up tops for my team to review, which ultimately created the style & look we wanted. 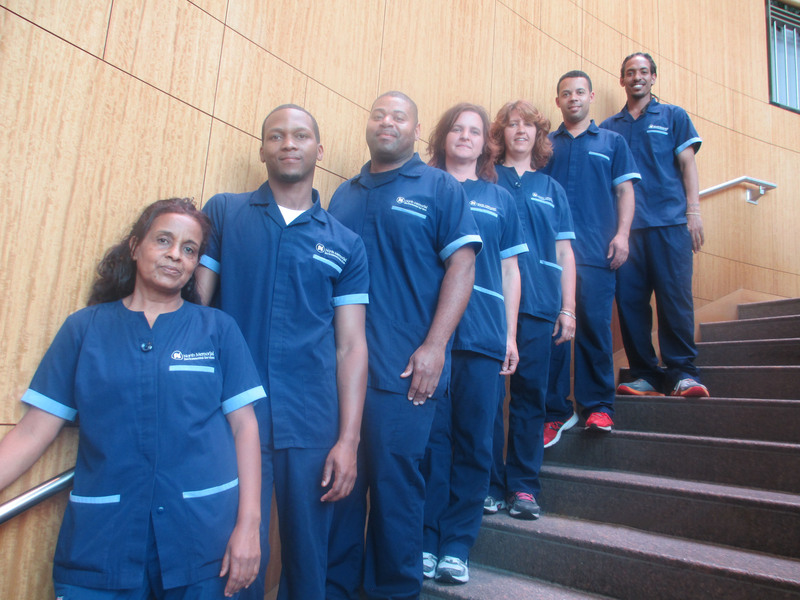 Uniform Advantage: What has been the staff’s feedback about their new uniforms? The colors and fabric, the fit and style? Michael Burke: Statements from staff have included “I love the new uniforms, the uniforms fit extremely well, I like the look of the new uniforms with several employees stopping him telling him thank you for the new uniforms”. What made the impact for me was the fact that there were many, many positive comments on the uniform. This has never happened with changing out uniforms in my 30+ years. Uniform Advantage: When you look good, you feel good. Right? As it has been a while since you last bought new uniforms, how has this impacted your team’s confidence levels on the job? Michael Burke: In July we implemented our appearance policy, the EVS staff look good and meet the new policy. Since implementation I have not had anyone give me negative feedback on the uniform, only positive which tells me they are happy with the input given as well as the outcome. 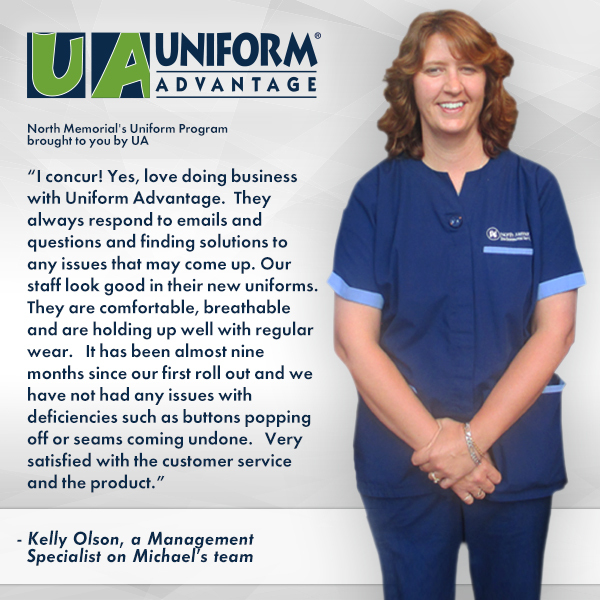 Uniform Advantage: How has this impacted your business overall with your patients and vendors? Are they buzzing about the new uniforms? Michael Burke: The old phrase, no news is good news. Uniform Advantage: Would you recommend us to another colleague? Michael Burke: Yes, I would give UA a recommendation for both product & solid customer service. I concur! Yes, love doing business with Uniform Advantage. They always respond to emails and questions and finding solutions to any issues that may come up. 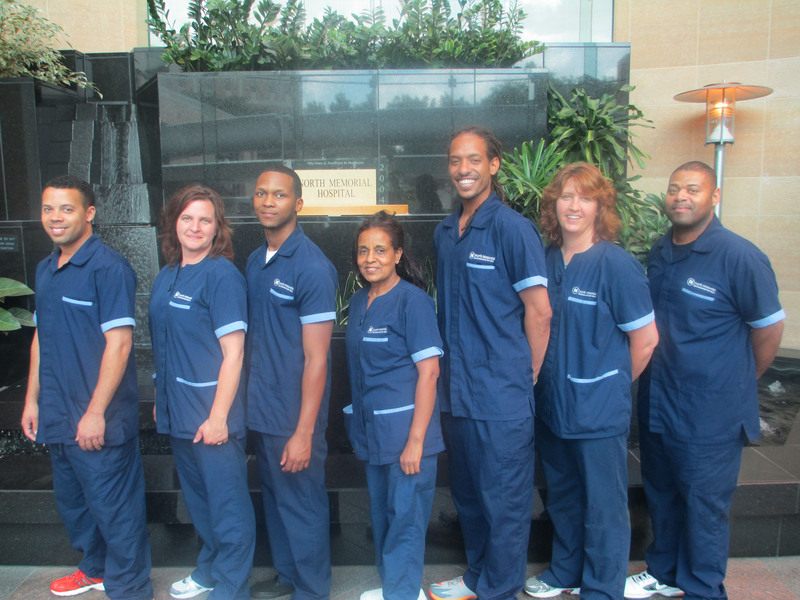 Our staff look good in their new uniforms. They are comfortable, breathable and are holding up well with regular wear. It has been almost nine months since our first roll out and we have not had any issues with deficiencies such as buttons popping off or seams coming undone. The few issues we have had were due to carelessness or accidental damage by the employee themselves. Catching their pockets on door handles or objects, spilling bleach on their uniform, leaky pen in their pocket, etc. Very satisfied with the customer service and the product. North Memorial Health Care is a comprehensive health care system that serves the north, central, and west communities in the Twin Cities metro area. But our reach extends far beyond these neighborhoods. Through our two hospitals and a metro-wide network of primary, specialty and urgent care clinics; outpatient centers; medical transportation; and home and community outreach, we are a regional leader in advanced medical care. In August 2014, North Memorial Medical Center became the proud recipient of Healthgrades America’s 50 Best Hospitals™ 2014 award for the third consecutive year. Healthgrades is the nation’s most trusted source of health care provider information. The 50 Best Hospitals honor recognizes 50 hospitals as the top 1% in the nation for consistent clinical excellence based on an analysis of risk-adjusted mortality and complication rates for common procedures and conditions. These hospitals are not only differentiated by their overall clinical excellence and have exhibited superior performance in caring for patients across a broad spectrum of care – they are those who have done so for a minimum of 7 and 4 years respectively.